I am thankful for help with the laundry. Emmett likes to whip all the clothes out of the washer onto the floor, and is very proud of himself for helping. When I ask him to do the laundry, he goes in to wait at the machines. 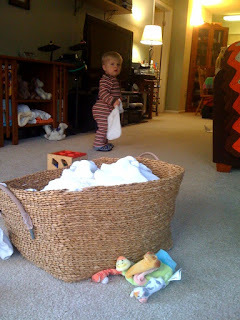 This afternoon, I took diapers out of the dryer (with his help, of course), and brought the basket of clean diapers out to the living room. I asked Emmett if he was going to help me fold the laundry. I guess all he heard was the word laundry, because he came over to the basket, grabbed a diaper insert and carried it to the washing machine.